L3a Stages are made for scanning and tracking. The basic positioning-range for X and Y is 600 μm. These stages are ideal for atomic-force and nearfield microscopy. They are only 30 mm high and offer 66×66 mm apertures. 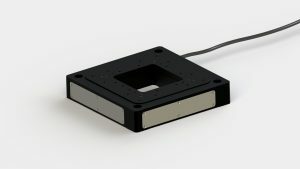 High precision frictionless flexure guiding leaves close to zero cross-talk and results in excellent flatness of motion. Versions with different Z-ranges are available, in order to serve those applications that require more dynamics and higher resolution, as well as those that have to cover larger height-variations.